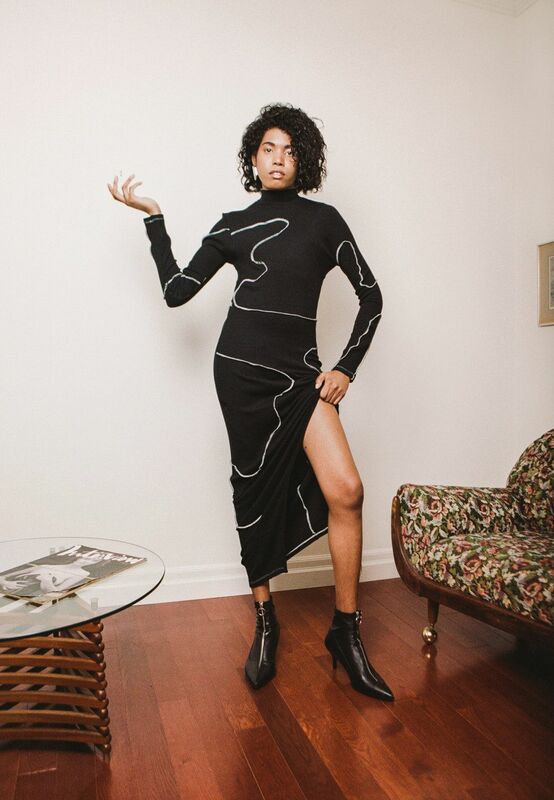 Spencer Badu makes clothes that are subtly aggressive. His brand, SP Badu, is unisex, and inherently challenges gender norms without preaching a specific political ideology to the wearer. He recently showed his latest collection "Mother" at Toronto Fashion Week, which marked one of Badu's first explorations with color — he used forest green and pink, a color he says represents girl power and femininity. So often, femininity is dismissed as weak and frivolous, but as Badu says, women are often responsible for keeping families together and for exhibiting remarkable emotional strength. He was raised by a single mother for most of his life, so the celebration of women and motherhood comes from a personal place. With his new brand, Badu designed clothes that simultaneously evoke strength and motherhood. It's also an interesting intervention in an industry that tends to valorize youth, assuming women are past their prime once they age and have children. PAPER caught up with Badu to speak about challenging normative ideas of beauty, designing beyond current trends, and avoiding celebrity culture. What was it like working with Bobby Bowen and Amalia on the lookbook? Bobby has been my main collaborator since I started. He does all the styling and we bounce ideas off each other in terms of creative direction at times. I like the idea of building a team and hopefully building a visual language so that if someone sees it down the line, they can say, "Ok yeah, that looks like SP Badu." In terms of the creative process, it's a good time. Amalia is my friend. I met her last year and then I had the nerve to ask her if she would be comfortable being in front of the camera for the lookbook and she was kind enough to say yes. And everything is unisex, so when she said yes, I had her come by the studio and adjusted the patterns to fit her properly in terms of how long her arms are and how long her legs are, so I made sure it looked really good on her. You describe your work as both minimal and aggressive. Those are two descriptors that at first may seem kind of opposite, but make sense when you look at your clothes. How do you play with the tension of each? In terms of design, I really like Bauhaus movement and people who put a more minimalist approach to design, more stripped down, form follows function, just getting rid of everything that doesn't need to be there is useful. I don't really do a lot of decorative or ornamental stuff with my clothes. In terms of aggressive, I would say the aggressive nature usually comes with the idealism of the clothes. Everything unisex is meant to really challenge gender and challenge people's comfort level in terms of what they feel like they can or cannot wear. With our casting calls, Bobby and I are really interested in casting people who are not normally cast within the fashion lens. I think that itself challenges beauty. When I feel aggressive, I would say it's more in terms of the ideas around the brand, and minimal is more design. Yes and no. I think when I first started the brand when I was thinking about being unisex, I'd say the first thing I probably did was a little political and loud, but I just didn't think it was genuine for me to potentially be the voice for certain movements and ideas since I wasn't part of those groups. It's hard for me to speak in terms of what a gay man goes through or what a trans person goes through if I'm not either. I think as the years went on, I was like, "Ok, I think that the world should go in this direction." but instead of it being very political, I wanted it to be more inclusive. But I think it's hard to not be political. We live in a world that is political. Everything we do is political, even if it's in a subtle way. Politics affect us all, so you can see the way collections look after Trump became president. You think about fashion after the war, the skirts dropped, the mini skirt was not a thing at that time. In terms of political, I would say yes, my clothes are political in ways, but not in a way where it feels like you're being preached to. I think it's more of a subtle way, like putting medicine in the candy. I feel like anyone that wears the clothes is making a statement in terms of challenging preconceived ideas of gender or beauty. I think that itself can be political. How do you think of beauty as separate from power? It really needs to come from a genuine place. I am surrounded by friends that could fit into the current idea of what beauty is, in terms of a fashion magazine or a commercial, and I'm surrounded by friends who probably wouldn't get picked for those jobs. But they're both beautiful. It's not like one is more beautiful than the other. It's kind of our job, whoever is the creative or whoever is trying to build that path, it's our job to challenge and present something new. I haven't really used models from agencies, I've just used my fiends. By doing that, you're kind of challenging the current state of what beauty is. Your clothing is gender neutral. That's getting a lot more mainstream attention now. What is the importance of designing a unisex brand especially in the current cultural moment? A couple years ago there was a big unisex craze where a lot of people were getting excited about the idea and a lot of the big retailers and designers jumped on that idea. And then you find that after a while they go back to their very gender specific clothing. But for me, it's about creating a world where there are really no rules and no limits. And couples can build a wardrobe and share each other's clothes. I also think in general, there's a fear of the unknown. If I was just making men's clothing, someone could go on my site and buy a pair of pants and they would know how it's going to fit. But because it's unisex, I get a lot of questions about fit and seeing size charts. Luckily I build my own size charts for my clothing, and I try to use those same patterns from season to season so people get familiar with how everything fits. "For me, it's about creating a world where there are really no rules and no limits." Do you embrace the idea that different bodies will fit into your clothes differently? Yeah I think our clothes are made for people, not for specific genders. I want people to wear what they want. I would say the brand is very inclusive. We have five different sizes and we hope that everything we produce can fit anyone from any size. You called the collection "Mother," though the clothing itself is unisex. How did you decide on such a gendered term for your line? I called it that because at the time when I was coming up with the collection, I wanted to challenge ideas of strength, especially in popular culture. There's this idea that the man is the person who is most powerful and strong, especially if you think of a corporation and who you imagine sitting at the top of it. I think we label women as soft and delicate but in general i feel that women are the foundation of the family, and of society. It was more about using feminine details with uniforms you would see in construction or military or a nine-to-five job and flipping that on its head to challenge those ideas of strength. I know if all goes down, my mom is going to hold it down. You made headlines a while back when A$AP Rocky wore one of your track suits. Are there other icons or celebrities you would especially like to see wearing your clothes? With him, it was amazing because I'm a fan of him as well. When I was in school and working on my collection, I would listen to his music and watch his videos. A couple years down the line, to have him wear my clothes was really exciting to me as a fan, not even as a designer. But in terms of celebrities, who knows? Honestly anyone that I'm a fan of or anyone who challenges the world. Any artist, and actor, writer, musician who challenges the world and shares the values I share, I think that would be best. If you don't share my values or you're not a good person and you're famous, I couldn't care less if you wear my clothes. Also, I don't want to get caught up with celebrity culture. It does help with exposure and the overall world of the brand — how many editorials you're in, who wears your clothes, and who publishes your work — but in terms of what I want to do, ideally the brand could build some longevity, and I think you need to do that by [focusing on] quality so that people can build a wardrobe and they can use these pieces for a long time. Celebrity [culture] is coolm but also very fickle. If I depended on celebrities, I don't know how long that would last. I definitely don't take it for granted and I love it, but it's something I try not to depend on. Do you try to think beyond specific trends to ensure your clothes last? I'm very rigid in terms of my designs. I use a lot of black. This is the first time I've used a lot of color. But I'm always reintroducing previous colors or aesthetics from previous collections. In my head, I'm building a story where every season there are new characters. It's very personal — I'm not really looking at trends. We work so far in advance that if I'm looking at a trend book and trying to incorporate it into my next collection, by the time I've developed the idea, I'm probably already late. There's no longevity in it. "Without them even knowing, the person who's wearing [SP Badu] is challenging preconceived notions of gender." Where do you find yourself looking for inspiration? I'm a big fan of contemporary art. Besides painting, I like a lot of sculpture. Architecture is also a big inspiration for me, places like the Guggenheim. The idea of sketching a building and then in a couple years you have a building made and it's a permanent fixture of everyday life. We are able to live in people's ideas 20, 30 years down the line. I think with architecture there's an idea of challenging the current state of how people think, but also a sense of longevity. I'm also learning how to be more conceptual. I went to a technical school, so a lot of things I was taught were based on making the best product possible, so everything needed to be sewn right and pressed right. Everything had to be perfect. Now I'm trying to be more conceptual. That's where more of the personal things come in, where my thoughts and inspirations come in. Do you think about the people who wear your pieces reflecting on the themes behind the line? It's kind of hard to translate the ideas behind the line into people's everyday life, because we live such separate and different lives, so it's hard for someone to completely live or embody what I was trying to embody with the collection. But with every piece there's this idea of challenging. Without them even knowing, the person who's wearing it is challenging preconceived notions of gender.